There are a lot of reasons to head to the coast at any time of the year. The ocean is always changing and calls to those of us who need to be reminded of how small we are. Coastal landmarks like Yaquina Head Lighthouse are like old friends that have the welcome mat out whenever you drop by. Combing the beach, hiking in the Coast Range, wandering through shops, and finding the perfect clam chowder are not limited by seasons or weather. So, on a blustery day in January, I abandoned my computer, packed snacks and rain gear, and headed for Newport. 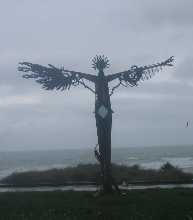 My goal was to visit the Visual Arts Center to see the felting exhibit and spend some time exploring Nye Beach. 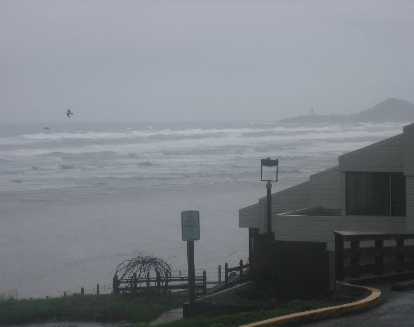 Nye Beach is a small community in Newport, Oregon, named after John T. Nye (1832-1911). He was one of the first settlers in what was Oregon’s earliest coastal community. His cabin on 3rd Street was only the second one built in the area. Parking in front of the Visual Arts Center is on the turn around on 4th Street. That was the site of the Natatorium in Nye Beach. Built by Dr. Henry Minthorn, step-father of President Herbert Hoover, it was an indoor pool filled with heated sea water. The salt baths were thought to draw poisons from the body and the health benefits brought travelers from near and far. The building also had a dance hall and showed movies. 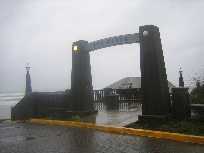 It was razed in 1967, and replaced by the parking area. The Newport Visual Arts Center offers a venue for coastal artists that is elegant and friendly. Art classes are taught in an upstairs room that, even on this rainy day, was flooded with light and a bird’s eye view of the wintry surf. The galleries are open Tuesday through Sunday in the afternoons. The exhibit was delightful. Wool art pieces lined the walls of the Upstairs Gallery. The expected hats and shawls were there but the unexpected were framed art pieces and some felted rugs. The portrait of a wolf could have been done with oils, the details were fine and expressive. But, the rugs were magnificent. Though they were small, 4’x5’ was the largest, they could have come from the salons of the tzars. The colors, textures, and patterns seemed too rich for being just felted wool. I signed up to be notified of the next felting class and headed down to the exhibits in the main floor Runyon Gallery. Here were oils on canvass and wood by Betty Dodson, and three-dimensional collage and sketches of the human form by Bob Coghill. Exhibits of local artists are changed monthly. Right next door is the home of the Yaquina Art Center. The old building that is owned by the Yaquina Art Association was built as changing rooms, bathrooms, and showers in 1914, with a $250 loan. In 1952, it became the art center where locals could take art classes and display their work. The classes are now held in the Visual Arts Center allowing the abundant exhibit of oils, watercolors, sculpture, glass, photos, china painting, and fiber and paper arts in the building to be changed frequently. Up the dune, I followed stone steps to come out above the Visual Arts Center onto 3rd Street. 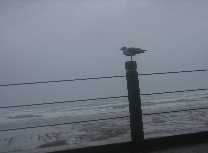 By ducking a bit behind the art center, I could stand out of the wind and rain and enjoy the wild surf at my feet. Seagulls, all facing south or hovering in place in the the heavy winds, posed for the lens of my camera. Walking south, I slipped into the office and gift shop of the Sylvia Beach Hotel. I could watch the waves for a few minutes from the comfort of the shop and I never miss a chance to wander the halls of this picturesque oceanfront hotel decorated in the themes of various authors. You are welcome to peek into rooms if the doors are open meaning that the rooms are not currently in use. Rainy day entertainment does not get much better than lurking about a grand old hotel. Outside of the Performing Arts Center I ran into Ron and Cindy Perez. 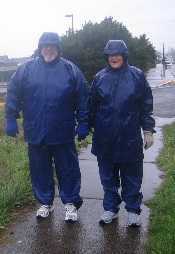 Dressed in matching blue rain gear they were strolling along the sidewalk, unbothered by the inclement weather. They laughed when I asked to take their picture to show how to dress for comfort at the coast in January. Former valley dwellers, they are now full time “coasters”. Having met my goal of checking out the Art Centers of Nye Beach, I decided to wander through the small Nye Beach neighborhood From what I can gather, it comes by its artistic nature naturally. Its beach houses and Victorian homes were populated by hippies and artists long before the 60’s. It was known as the “Honeymoon Capitol of the World”. The narrow streets are lined with small cottages as well as multi-story homes and hotels. Some are sided with worn, grey boards, while others have been painted with the colors from a child’s crayon box. The tiny yards are filled with tended garden plots or flotsam flung from the sea. All are interesting and mostly inviting. Entering the Twining Thread, a stitchery shop, you climb an exquisitly curved indoor stairway to the main level. Thank goodness for those among us who opt for renovation! The area is only about six blocks square but you could easily spend days and never leave the area. Cottages, hotels, and bed-and-breakfasts are surrounded by little shops of every kind. You can get your hair cut or done, buy groceries, find a good book, pick up clothes for yourself or the kids, find just the right nick-nack for any nook or cranny, get a whiff of freshly baked breads, lunch on fish tacos, visit art galleries, find your wine for dinner, pick out the perfect smelling soap for a soak, choose from a variety of dining experiences, go to the theater or a concert, have a glass of hot spiced wine, and fall asleep in a simple or elegant bed. When you awake, breakfast is usually included and right out the door is the Pacific Ocean. From your lofty perch on the dunes, you can watch for porpoises, sea lions, or whales. 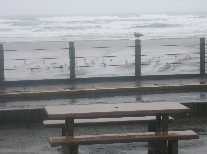 You can watch the tide come and go from the shelter of your room or from one of the restaurants with an ocean view. The sand is at your doorstep with the chance of collecting some of those coveted beach finds everyone comes home with. On the north end of the beach you can visit Jump-Off Joe Rock, where stories tell of star crossed lovers who decided to end it all with a leap into the ocean. You can get a shot for your pet, get your web page designed, hire a lawyer, relax with a massage, get stitching or scrap booking supplies, and enjoy high tea. In the event of an emergency, your ambulance service is even located in Nye Beach. It is all within walking distance and yet remains a cozy, picturesque neighborhood. Check the newspaper or Newport, Oregon, web sites for events and happenings or just head west on a blustery, January day and take pot luck.